Ousted union president Steve Conn and a group of teachers are now calling Monday the next day for action. They are calling for a city-wide strike on that day, urging teachers, parents, and students to attend a court hearing. The Michigan Court of Claims is holding a hearing on Detroit Public Schools' request for a temporary restraining order against organized sick-outs. Shanta Driver, the lawyer for Conn, called that request, " absurd and obscene." She's also calling for everyone to show up for the court hearing Monday morning, saying, "If it means walking out of schools, if it means marching down the street, if it means taking the bus, get there." This group says the rolling sick-outs are building to a longer lasting strike. 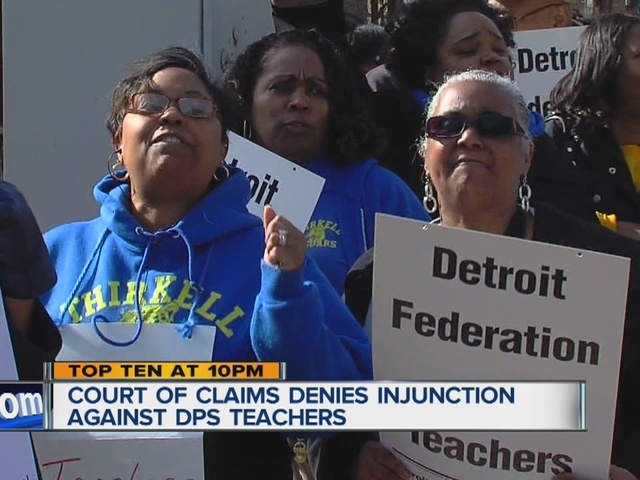 The Detroit Federation of Teachers released a statement saying it's pleased with court's early decision Thursday to deny the temporary restraining order. Detroit Public Schools released their own statement as well, saying it looks forward to informing the court about the serious effects of these sick-outs.